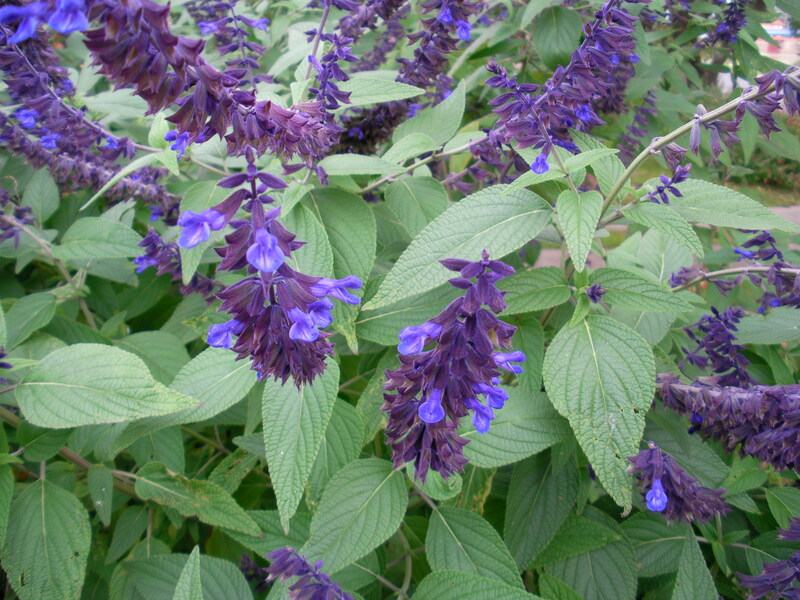 One of the best landscapers’ plants is Salvia microphylla ‘San Carlos’. It is very long flowering in hot weather, evergreen, hardy to drought and frost, around a metre in height. It will sucker and spread in time. Mature plants can be cut right down or just trimmed. Best in sun. will take almost any climate. Most of the microphyllas are easy to care for. Microphylla red and microphylla cerise are around a metre high and less wide. They are very easy to grow and flower an amazingly long time. ‘Anthony Parker’ is a salvia with leucantha in its parentage. It is evergreen. If it is not crowded it will form a rounded bush made up of a collection of stems, roughly 1.5 m high and wide. In time it will layer and extend its area. It takes some frost and an established plant will take drought. Meigan’s Magic is an Australian variation of ‘Anthony Parker’ and grows quite large, roughly 2m x 2m. It flowers a lot, the flowers being quite striking. 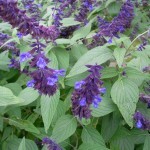 Salvias that are massed for long term effect and minimal maintenance are useful in large gardens with time poor owners. Some salvias flower for months. Those listed don’t need shaping more than once or twice a year and can be abandoned without detriment. They are fairly bushy so weeds are often smothered. I don’t have large stocks for landscapers of any one plant but there is no harm in asking! 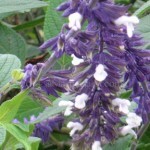 Africa is a good place to start when landscaping with salvias unless you are very wet. Africans are usually very drought hardy and give a lot for very little input. The leaf and flower colour blend well with Australian natives usually. Californians are dry tolerant but don’t look so well in the off season – usually summer, when they are often dormant. A lot of the larger Mexicans need pruning to shape their growth so they haven’t been included. African Sky – evergreen shrub to 2m, frost and drought hardy, Fls. October – May, pretty blue fls. Chamelaeagnea is another evergreen African multi trunked bush to 2m, frost and drought hardy, summer flowering mauve and white. Dolomitica is grey leafed evergreen smaller shrub about 1.5m, frost and drought hardy, mauve fls spring onwards. Koyamae is a groundcover for shade and would do well in tropical regions I imagine. It comes from Japan, is winter dormant – not out of sight. Lovely lemon flowers summer/autumn. Somalensis is used to tough conditions. It is an evergreen shrub about 2m with pale blue fls. 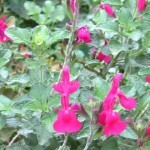 ‘Hot Lips’ is a microphylla type of salvia that flowers red and white for a very long period. The small leaves make it good for hedging but it will expand its area. Drought and frost hardy. 1m. ‘White hot’ is an Australian variation which has pure white flowers in hot weather. Microphylla red and cerise are excellent evergreen plants up to a metre for drought and frost and long flowering. Microphylla ‘Huntington’ is also recommended but could do with a shearing or two in warmer weather for a bushy clump. Microphylla ‘San Carlos Festival’ is an excellent plant for tight foliage and long flowering – cerise. Leucanthas are easy salvias to use in a row and flower abundantly in mild climates. Frost can curb them but shouldn’t kill an established plant. They come in a few colours. Evergreen foliage about 1m which could be cut down at times depending if you have frost. ‘Waverly’ is a good clumping evergreen salvia which flowers mauve most of the time, around a metre. Its sport ‘Phyllis Fancy’ is about twice the size but similar plant and only needs an annual shorten in spring.